Most horses today are treasured for their ability to run, work, or be ridden, but have lost their wild-type camouflage: pale hair with zebra-like dark stripes and markings known as the Dun pattern. Now an international team of scientists has discovered what causes the Dun pattern and why it is lost in most horses. The results, published today in Nature Genetics, reveal a new mechanism of skin and hair biology, and provide new insight into horse domestication. The work is an international collaboration led by groups at Uppsala University, Uppsala, Sweden, and the Huntsville Institute of Biotechnology, Huntsville, Alabama, USA. Pale hair colour in Dun horses provides camouflage as it makes a horse in the wild less conspicuous. In contrast, domestic horses, as well as many other domestic animals, have been selected over many generations to be more conspicuous, more appealing or simply different than the wild type. The pale hair colour in Dun horses does not affect all parts of the body; most Dun horses have a dark stripe along their back, and often show zebra-like leg stripes. However, the majority of domestic horses are non-dun and show a more intense pigmentation that is uniformly distributed. - Dun is clearly one of the most interesting coat colour variants in domestic animals because it does not just change the colour but the colour pattern, states Leif Andersson, whose group led the genetic analysis. We were really curious to understand the underlying molecular mechanism why Dun pigment dilution did not affect all parts of the body. The research team started by analysing the distribution of pigment in individual hairs. - Unlike the hair of most well studied mammals, the dilute coloured hairs from Dun horses are not evenly pigmented the whole way around. 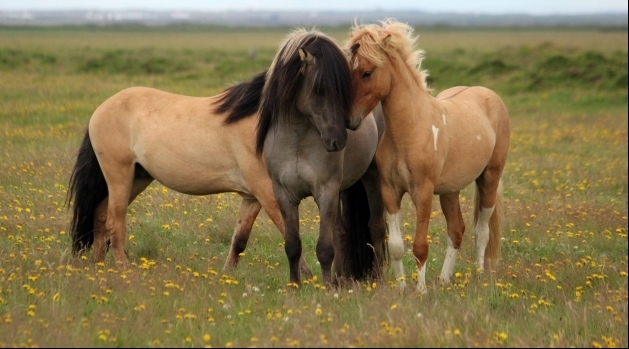 They have a section of intense pigmentation along the length of the hair, on the side that faces out from the body of the horse, whilst the rest of the hair has more or less no pigment, explains Freyja Imsland, the lead author for the genetic analysis, and a PhD student in Andersson's group. The hairs from the dark areas of Dun horses are in contrast intensely pigmented all around each individual hair. In spite of scientists having studied hair pigmentation in detail for a very long time, this kind of pigmentation is novel to science, and quite unlike that seen in rodents, primates and carnivores. Genetic analysis and DNA sequencing revealed that Dun versus non-dun colour is determined by a single gene that codes for the T-box 3 (TBX3) transcription factor. In humans, inactivation of the TBX3 gene causes a constellation of birth defects known as Ulnar-Mammary Syndrome. But in horses that have lost their Dun colour, TBX3 mutations do not inactivate TBX3 protein function and instead only affect where the gene is expressed in the growing hair. - Previous studies in humans and laboratory mice show that TBX3 controls several critical processes in development that affect bones, breast tissue, and cardiac conduction, explains Greg Barsh, whose group led the tissue analysis. We were surprised to find that TBX3 also plays a critical role in skin and hair development. The team discovered two forms of dark, non-dun colour, non-dun1 and non-dun2, caused by different mutations. - Non-dun horses have much more vibrant colour than Dun horses. Non-dun1 horses tend to show primitive markings similar to Dun horses, whereas non-dun2 horses generally don't show primitive markings. These primitive markings in non-dun1 horses can sometimes lead horse owners to think that their intensely pigmented non-dun1 horses are Dun, states Freyja Imsland. To understand how TBX3 affects hair colour, they measured TBX3 distribution in individual hairs relative to other molecules previously known to regulate pigmentation. - In growing hairs, TBX3 mirrors the distribution of melanocytes, the cells that produce pigment, explains Kelly McGowan, a senior scientist in the Barsh group. Our results suggest that TBX3 affects differentiation of specific cells in the hair, creating a microenvironment that inhibits melanocytes from living in the "inner" half of the hair. The group speculates that the signals governing where TBX3 is expressed could help to explain zebra stripes. - The region of the body where TBX3 is expressed may account for the stripe pattern, says McGowan, whereas the region of the hair where TBX3 is expressed may account for colour intensity. The results of the present study indicates that the non-dun2 variant occurred recently most likely after domestication. In contrast, both the Dun and non-dun1 variants predate domestication, which is evident from the observation that ancient DNA from a horse that lived about 43,000 years ago, long before horses were domesticated, carried both Dun and non-dun1 variants. - This demonstrates that horse domestication involved two different colour morphs (Dun and non-dun1) and future studies of ancient DNA will be able to reveal the geographic distribution and the abundance of the two morphs, ends Leif Andersson. SciLifeLab is a Swedish national centre for molecular biosciences with the focus on health and environmental research. The centre combines advanced technical know-how and state-of-the art equipment with a broad knowledge of translational medicine and molecular bioscience.